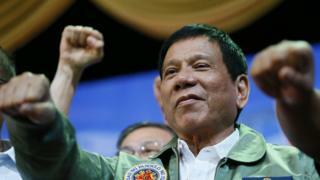 Image caption President Rodrigo Duterte has previously called the US president the "son of a whore" and the UN chief "a fool"
Philippine President Rodrigo Duterte launched an expletive-laden attack on the European Union after it condemned his brutal crackdown on crime. Mr Duterte said the EU parliament was acting out of guilt after it called on him to halt "the current wave of extrajudicial executions and killings". He said "hypocritical" former colonial powers like France and Britain were trying to atone for their own sins. Since Mr Duterte took office on 30 June about 3,000 people have been killed. They have been killed either by police or vigilantes, after the new president effectively sanctioned the murder of criminals and drugs dealers. The killings have been widely condemned internationally. The European Parliament said it was concerned about the "extraordinarily high numbers killed during police operations... in the context of an intensified anti-crime and anti-drug campaign", and asked Mr Duterte to launch an "immediate" investigation. But the president hit back angrily, saying the European Parliament's colonial-era ancestors killed "thousands" of Arabs and other peoples. "They're taking the high ground to assuage their feelings of guilt. But who did I kill? "Assuming it to be true - 1,700, who are they? Criminals. You call that genocide," he told officials in Davao. "Now the EU has the gall to condemn me." US President Barack Obama - arguably the world's most powerful man - cancelled a meeting with Mr Duterte after he was said to have called him a "son of a whore". Mr Duterte later said he didn't mean it personally. He may have been sorry for that particular insult, but it didn't stop him calling UN Secretary General Ban Ki-moon a "fool" days later. US presidential candidate Donald Trump hasn't even been elected, but he has already had a tongue-lashing from Mr Duterte who said: "He is a bigot and I am not". US ambassador to the Philippines, Philip Goldberg, has been called a 'gay son of a whore', accused of meddling in the elections. And his ire is not just reserved for politicians. While mayor of Davao City, he turned on Pope Francis who got stuck in traffic during his visit to the Philippines. "I wanted to call him: 'Pope, son of a whore, go home. Do not visit us again'," he said, later writing to the Pope to apologise for his outburst. The 71-year-old also swore repeatedly during the outburst, and raised his middle finger in a gesture of defiance. Mr Duterte said on Sunday he needed to extend his crime war for another six months because the drug problem was worse than he expected, adding on Tuesday that he would shield police and soldiers from prosecution.